For the Quinlans of La Grange Park, the Chicago Triathlon SuperSprint race, a 375-meter swim, 10K bike and 2.5K run for a total of 12.9K or 8 miles, made for a perfect event for the whole family. Maura Quinlan, 50, her daughter Claire, 18, and son Michael, 16, all completed the SuperSprint last year, wishing they had tried it sooner. “The course was accessible and easy, and volunteers were helpful in a relaxed atmosphere,” Maura says. “We looked like an athlete family with medals and our race numbers tattooed on our arms. I was so thrilled we did it!” As a newcomer, she didn’t feel out of place. This year, her husband, Kyran and other son, John, 13, will join in with the rest of the family in the triathlon. To prepare for the race, Maura and Claire swam laps in their community pool for 20-minute sessions and swam in Lake Michigan at the 63rd Street beach once to test the open water. Maura cycled on her touring bike, minus the basket her kids insisted she ditch, and the kids rode their mountain bikes. On race day, received race-issued swim caps and wore swimsuits. Maura and Claire slipped on running shorts over their suits before saddling their bikes and clipping on their helmets. Maura and Claire enjoyed the SuperSprint so much that they are now training together for the Naperville Sprint. This time, rather than being in separate age group waves, they will be together in the “buddy” wave. A Super Sprint triathlon covers approximately half the distance of a traditional sprint triathlon and doesn’t demand heavy training or elaborate equipment. The eight-mile course is typically spectator friendly, which has also helped build the distance’s popularity. According to USA Triathlon, the Super Sprint age group distance format evolved from the Australian elite triathletes training for speed before they attempted longer distances. The first publicized Super Sprint for elites took place in 2010 in Oceanside, California. The short distance has grown in popularity among age groupers as good option for beginners and people who want to work on speed. The short distance results in a a quick recovery time, so experienced triathletes can race often. Scott “Hootie” Hutmacher, USA Triathlon certified coach and regional marketing manager for Life Time Athletic Events says the first Chicago Triathlon SuperSprint race was in 1991, and in the past four years he’s seen the numbers jump by 350 participants. In 2014, the race introduced a Divvy wave that provided participants with a Divvy bike to use during the bike portion of the course. This group competition sold out last year and is on track to sell out again this year. In a multisport event, training in all three disciplines takes planning and preparation. If you have a base level of fitness, allow yourself eight to 12 weeks of training, beginning with two hours and gradually increasing to four hours a week. Initially, consider your strengths and weaknesses. If you’re a strong runner and sink in the pool, work on swimming an extra day per week by taking a class or clinic to benefit from some instruction. Hutmacher notes that the average person completes the SuperSprint in 50 minutes. Participants don’t need previous triathlon experience, but he does encourage people have some open water swim practice with a group. The Chicago Triathlon offers free swim clinics at Ohio Street Beach starting on June 30. 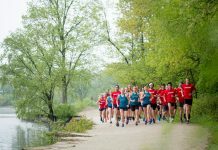 Open registration begins on June 1 on their website, www.chicagotriathlon.com. For the first time this year, the YMCA Leaning Tower Triathlon offered a SuperSprint race, which generated a great deal of interest. Susan Price, training group leader for the YMCA Leaning Tower Triathlon, recommends working out at least three days a week, aiming to do each discipline twice a week with one of these sessions being a brick workout: a swim-to-bike or bike-to-run workout. The amount of time devoted to training will depend on your fitness level, goals and schedule, but do focus on your weakest sport and try to cover more than the event distance in order to have a little extra in your tank on race day. 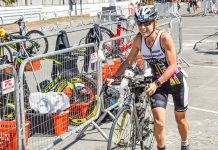 Whether swimming, biking or running, start training at a comfortable pace and gradually work up in effort while focusing on technique. Kris Swarthout, a certified USA Triathlon coach, recommends practicing swimming up and down the shoreline and in a straight line. Get out and ride your bike on the road or take a spin class, and when running, don’t be afraid to take walk breaks. For example, walk one minute, run five minutes, then increase your speed or make your walk breaks shorter and running time longer. Eventually, start putting the workouts together to do a brick. After biking, run for 15 minutes to see what it feels like to run off the bike. Practice multiple transitions in your garage so you can practice changing shoes and putting on your helmet and sunglasses so you develop a routine. At first, Swarthout says, be methodical, and then transition quicker each time. He adds to include a rest day in your workout week to allow your body to recover and gain strength, preparing you for the next workout. bathing suit or a triathlon suit, which can be worn through out the entire race. running shoes, which can also be worn on the bike. Just about any bike will do, but have it well tuned and fitted for you. Make sure the brakes work and that you have a current helmet. Prior to race day, review the course online and know where to park, leaving plenty of time to get into transition and set up your bike prior to the transition closing. 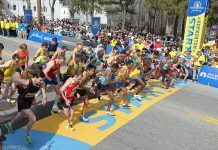 On race day you may have nerves to manage, which is normal when embarking on an exciting event. Focus on yourself and not on others around you. Expect some surprises and go with the flow. Maura presumed she’d be with her family in the same wave, but when she arrived at the race was directed to an area in transition with ladies her age. She was comfortable being with her own age group and with those who were also first timers like her. By being prepared, trained and on time, you can reach your goals and the finish line with a smile and a little extra energy.